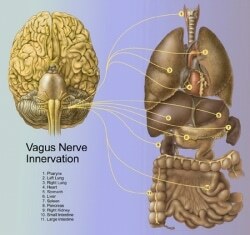 The vagus nerve is the longest of the cranial nerves and has fibers spanning from your brain stem to all your organs. Like a vagabond (where the name comes from), it wanders all over your body. It is the command center of your parasympathetic nervous system. Your parasympathetic nervous system controls “rest-and-digest” mode. This is in contrast to the sympathetic nervous system, which controls “fight-or-flight” responses when we are threatened or stressed. Your vagus nerve can be strengthened by stimulation, or weakened by lack of stimulation. You can have an under-active vagal response or an over-active response. Your vagus nerve in your GI tract sends messages to your brain. That “gut feeling” is a very real phenomenon. This study shows that innate anxiety and learned fear in rats is regulated by signals from the gut. Studies on both rats and humans have shown that stimulating the vagus nerve helps strengthen and consolidate memories. Promising news for those suffering cognitive decline and neurodegenerative conditions like Alzheimer’s. This is a big one! Incredible research by neurosurgeon Kevin Tracey demonstrated that nerve stimulation by electrical implants caused a drastic reduction in symptoms and even remission in rheumatoid arthritis patients. Similar studies have been done showing dramatic improvement in a number of inflammatory responses and diseases throughout the body. The vagus nerve tells the body to calm down by releasing acetylcholine. This chemical prompts a number of other chemicals like oxytocin, vasopressin, and prolactin to be secreted. As a result: heart rate slows down, breathing calms, you feel more able to bond and connect with others, digestion is stimulated, and muscles relax. Fun fact: mercury blocks acetylcholine. Mercury toxicity is an increasingly common problem due to mercury in our natural resources (water, air, food), and amalgam “silver” dental fillings. You can have your heavy metals levels checked through blood, urine, and hair tests, but the best indication often comes from your health history and symptoms. The vagus nerve impacts these two very important functions directly. It controls your heart rate via electrical impulses and tells your lungs to breathe through acetylcholine secretion. Slow digestion– food sits in your stomach too long. This can cause acid reflux or GERD, bloating, or constipation. One of the best signs of strong vagal tone is when your heart rate increases slightly with inhalation, and slow slightly with exhalation. How do you strengthen the vagal nerve? About 60% of vagal nerve tone is determined by genetics, but there is a solid 40% that we can impact! Learn a number of ways to strengthen and stimulate the vagus nerve. Fun fact: you CAN overstimulate the vagus nerve, and this is the most common cause of fainting. If you’ve ever fainted or felt light-headed after giving blood or getting a shot, you likely experienced “vasovagal syncope”. When you are under very high stress your vagus nerve becomes too stimulated and your heart rate drops quickly causing you to feel woozy or lose consciousness. It’s only temporary, and sitting or lying down usually resolves the feeling quickly. No damage has been done, so don’t worry! Weak vagal nerve tone is linked to inflammation, depression, loneliness and heart attacks. We want to make sure our vagal nerves are strong! The following all stimulate the vagus nerve just enough to be very therapeutic, but not so much to cause fainting–as these are not highly stressful events. Gargling helps stimulate the vagus nerve, although dainty gargling won’t do it. You need to gargle loudly and aggressively, to the point of almost gagging. Doing this daily will help increase the responsiveness of your vagal nerve to regulate relaxation, digestion, metabolism and more. Fascinating research with didgeridoos showed that playing the instrument is effective in treating obstructive sleep disorders and sleep apnea through its strong stimulation of the vagus nerve. Further research shows that a number of inflammatory conditions also improved. Most wind instruments stimulate the vagus nerve. Holding your breath for 6-8 counts stimulates the vagus nerve. Try this: Use your belly to breathe in for a count of 6, hold for 6-8, and exhale slowly through pursed lips for 6-8 counts to get your vagus firing. It’s important to be able to feel your diaphragm (that line between your stomach and ribs) moving up and down with each breath. It takes about 10 minutes of this breathing to feel the deeply relaxing effects of the vagal nerve stimulation. Learning loving-kindness meditations improves vagal tone. This is due to its effect on positive emotions and positive connections. There more positive emotions and connections we have, the stronger our vagal tone. Download my free meditation handout. Or try this guided meditation. Acupuncture is amazing for helping to regulate vagal nerve response. At my office, I’ve developed a very effective technique using electroacupuncture on specific ear and body points that stimulate the vagus nerve to strengthen tone and regulate vagal response. Electroacupuncture uses a small machine that emits a painless electromagnetic pulse. The electromagnetic pulse feels like a slight buzzing or tapping and is not unpleasant. After 20-30 minutes of this, you will leave the office feeling incredibly relaxed. That vagal nerve stimulation will help regulate all the processes controlled by the vagal nerve, which by now you know is a big deal! Can you spot the acupuncture points in the photo above? Bioelectronics is an emerging field of medicine in which small devices are implanted to stimulate different nervous system pathways. This successfully treats a range of diseases and inflammatory symptoms. This is very exciting and very validating of acupuncture–which uses needles and sometimes electricity to stimulate the nervous system at different points to treat a range of disease and inflammatory symptoms. If you want to be on the cutting edge of scientific research, and avoid surgery to implant a metal device– try the less invasive way, acupuncture. I want to set up an appointment! Hello! What auricular point to do hook up the e-stim to for this tx? I am an acupuncturist and I feel this would greatly benefit a could patients of mine! You hook it up bilaterally? micro or mili current? Thanks so much! Hi Marisa, I used Lung 1/Ht area in the center of the main fossa. I do bilateral, milicurrent. My daughter is inconstant fight or flight. Dysautonomia. She is in sympathetic overdrive. How would you bring in the parasympathetic to give her body relief? I’m sorry to hear about your daughter. That must be so hard for both of you. I highly recommend acupuncture and using the other techniques included in the free download to strengthen vagal tone. I’m glad you found this helpful. Your best bet is to schedule with an acupuncturist locally! I must say that vegans are often the patients I see in the worst shape in my clinic. Be sure you’re doing it intelligently and eating enough protein and not relying on soy products. Best luck! I’ve suffered from vagal nerve issues for quite a while, I’ve found that stimulating it makes my symptoms worse, so is there any way to heal the nerve without stimulating it? I would really appreciate your opinion because there isn’t anyone i can ask about this and you seem to know a lot about this. Hi Gus, stimulation can cause a strong vasovagal response, but there are ways to regulate the autonomic nervous system with acupuncture that would likely help. Mediation is very helpful for this as well.